May 17 and May 31, from 1-2p. Your organization is unique! Many factors dictate ‘how’ and ‘what’ colleagues learn, share, and communicate amongst each other. Join us to learn how to evaluate your organization’s knowledge needs, and begin to craft a knowledge management program that is such a natural fit, it was almost meant to be! We present two case studies from private-sector engineering companies. Each company was driven by goals to launch and implement a knowledge management program, supporting firm growth and culture change. The case studies explore decisions made based on analysis of firm culture, corporate strategic plans, and system integration and implementation, as well as related internal communications campaigns. Each case study also details results to-date on the knowledge management programs. What does it take to apply Knowledge Management capabilities into real application? How do you change a culture, resistant to change, to see the advantages of KM? THE US SOUTHERN Command’s Knowledge Management Office, located in Miami, FL, is responsible for providing and transferring vital information and knowledge throughout its Area of Responsibility (Central and South America and the Caribbean.) The real test of KM’s Rapid Response capability was tested when Hurricane Matthew devastated Haiti in 2016. This presentation demonstrates some of the tools and techniques that were used and which helped to change a resistant culture. How you deploy knowledge management is dependent on your organization’s goals and needs. Learn what tools will help you mitigate the potential loss of knowledge due to retirements and the changing workforce; make knowledge and information findable; improve performance; and support innovation. Major lessons learned over twenty years will be shared to help you be successful. Click here for a complete transcript from our Questions and Answers portion. Becky Burke Becky Burk is the Performance Management Manager at the Maryland Department of Transportation’s State Highway Administration (SHA). Her office is the source of performance measurement reports for the Governor, legislature, Department of Transportation, the general public and within SHA regarding how well SHA is performing. Becky is a member of the AASHTO Knowledge Management Task Force and participates on several AASHTO NCHRP committees that relate to Knowledge Management. Becky earned her Bachelor of Science in Business degree from Miami University, Oxford, Ohio. Alex Linthicum Alex Linthicum leads the knowledge management program at the U.S. DOT Volpe National Transportation Systems Center. He is responsible for enabling 1100 federal employees and contractors across more than 20 business units to find who and what they need, when they need it. Mr. Linthicum leads both client-facing and internal programs and projects focused on strategy, knowledge management, and planning. Mr. Linthicum has degrees in Systems Engineering and Urban Planning from University of Virginia. Molly Johnson is responsible for directing the corporate communications program for Dewberry, a 2,000- person engineering firm. She oversees a team of communications and graphics professionals and interfaces regularly with leadership on internally and externally facing initiatives. Molly recently directed the implementation of Dewberry’s social intranet and is currently leading knowledge identification, collection, and transfer activities. She also has responsibility for cultural initiatives, strategic planning efforts, acquisition integrations, and branding. She has 20 years of experience with professional services firms and is a graduate of Davidson College in North Carolina. She has been a guest columnist and contributing author for multiple architecture/engineering industry publications. Kathy Schumann Kathy Schumann leads employee communications at Mead & Hunt, a nationwide design consulting firm with 550 employees who have diverse expertise and experiences. She is an 18-year veteran of the company, growing her communication skills on the marketing team before taking on the firm’s internal communications role. Kathy is responsible for generating employee engagement regarding knowledge management. She analyzes communication processes for best fit with company culture. Shellie Glass Dr. Shellie R. Glass has almost 25 years’ federal civilian experience with the Army, Air Force, and Navy. She developed graduate level curriculum at the US Army War College and established four Knowledge Management Programs for the Army’s Logistics Innovation, the Army’s Human Resources Command and currently the US SOUTHCOM. As the US SOUTHCOM’s Chief Knowledge Officer, Dr. Glass leads the command’s Knowledge Management program and project management and business process re-engineering capabilities. She actively networks with leaders of industry, academia, professional associations, and other government agencies on KM. Dr. Glass speaks frequently at conferences, as guest presenter for university courses, and via webinars. Dr. Hammer is a principal researcher with Battelle Memorial Institute in Knowledge Management and has over 25 years of experience in information and knowledge management. During that time, she has created and managed library and information services and knowledge management programs in a variety of industries and is an acknowledged expert in knowledge management in government organizations. She was the Knowledge Officer for one of the largest state departments of transportation and was responsible for creating a program to support knowledge transfer, information services, succession planning, and content and document management. She has significant experience in knowledge transfer tools and techniques, the development and maintenance of knowledge portals and business intelligence delivery systems, information and library services, taxonomy creation, content and document management, and knowledge architecture. She has expertise in leadership and management theory and practice, organizational development, succession planning, change management and conflict management as both a professor and practitioner. 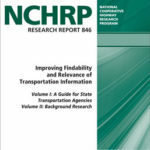 http://www.trb.org/Publications/Blurbs/176113.aspxTRB’s National Cooperative Highway Research Program (NCHRP) Report 846: Improving Findability and Relevance of Transportation Information (Volumes I and II) provides practices and tools to facilitate on-demand retrieval of useful information stored in project files, libraries, and other agency archives. The report defines a management framework for classification, search, and retrieval of transportation information; documents successful practices for organizing and classifying information that can be adapted to search and retrieval of the diversity of information a transportation agency creates and uses. 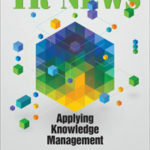 http://www.trb.org/Publications/Blurbs/175322.aspxTR News: Applying Knowledge Management (Sept/Oct 2016) Articles cover transportation knowledge networks and communities of practice; lessons from the use and value of knowledge management in other fields; knowledge, information, and learning culture; experience at transportation agencies, including a CEO’s perspective; supporting strategic change and preserving institutional knowledge; plus an overview of the research and applications—and more. 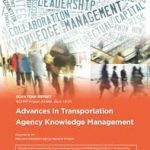 This report summarizes the findings from a scan workshop of Knowledge Management (KM) within transportation agencies and other organizations. The purpose of this scan was to identify and document successful KM practices and identify additional needs to advance KM in transportation agencies. 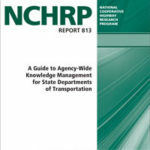 TRB’s National Cooperative Highway Research Program (NCHRP) Report 813: A Guide to Agency-Wide Knowledge Management for State Departments of Transportation presents guidance for state transportation agencies on adopting an explicit knowledge management (KM) strategy and the ways that organizations have implemented such strategies. KM is an umbrella term for a variety of techniques for preserving and enhancing the knowledge of an organization’s employees and effectively employing that knowledge as a productive asset. Looking for concrete practical tools about how to develop your own Knowledge Management plan? Check out the Virginia Department of Transportation’s Knowledge Management Toolkit. This toolkit will help you implement new methods in your organization to better utilize the expertise that you have, and to improve ongoing processes and procedures to retain critical knowledge.